1. Sprinkle the pork chops with salt and freshly ground pepper on both sides. 3. Add the garlic and stir for 2 -3 minutes, do not let it brown. 4. Raise the heat to high and add the pork chops, brown for 5 minutes on each side. 5. When pork chops are browned to your liking, remove them from pan and set aside. 6. Remove the garlic and pour off all of the fat except for about 2 tablespoons. 7. Turn the heat to high, add the wine deglazing the pan, and let it boil for about 3 minutes. 8. Return the pork chops to the pan with any juice that has collected. 9. Add the cherry and roasted peppers and mix them in. 11. Remove the cover, lower heat to medium and cook for 5 more minutes turning the chops once or twice. 12. Stir in the balsamic vinegar and continue cooking for 3 minutes more. 13. 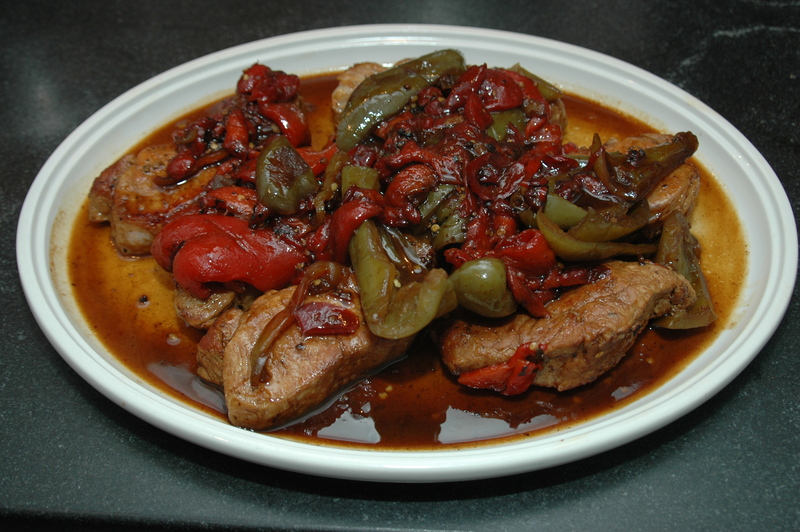 Remove the pork chops and peppers to a plate and cover with aluminum foil and reduce the gravy, or add a tbsp. or two of Wondra® to a thicken to your liking. We usually serve this dish with sides of fresh broccoli rabe, sautéed in garlic and oil and Pearled Couscous, which soaks up the extra gravy very nicely. Note 1: If you do not have a stainless steel or cast iron skillet, which gives the best browning, use a non-stick skillet, but halve the amount of olive oil. Note: 2: At this point, you can transfer the pork and peppers to a pot or casserole, add the balsamic vinegar to the gravy and thicken to your liking, then add to the pot or casserole and cover for up to 2 or 3 hours. The chops will continue cooking from the residual heat. Ten minutes before serving re-heat the pot and serve as above. Actually… this is my favorite! Richie, can this be done w’out the hots? We made this last night to serve to new friends, but working in a kitchen that is not ours, we did not have access to our usual utensils. Accordingly, we adapted the recipe for a non-stick skillet and prepared the bulk of the dish in advance. These updates are noted in Notes 1 & 2. Flexibility is key to any recipe. That looks and sounds wonderful. Hot sweet peppers does it for me. It is a good combination, not overly hot, not overly sweet. A great favorite in our family.